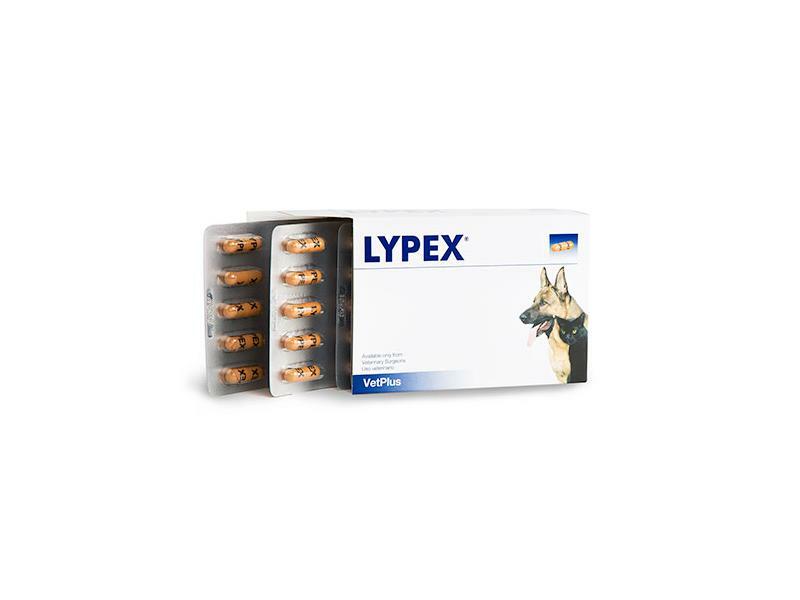 Lypex Pancreatic Enzyme Capsules are a top quality, veterinary grade, pancreatic supplement that have been specially developed for the control, management and support of exocrine pancreatic insufficiency, irritable bowel syndrome, brush border enzyme deficiencies and bile salt deficiencies. Through quality nutrition, the effects of exocrine pancreatic insufficiency can be mitigated and managed. The enzyme ingredients in Lypex granules have a special enteric coating, which protects them from stomach acid when swallowed. More of the active enzyme reaches the intestine where it can be effective. This has been clinically proven to produce better weight gain in dogs with pancreatic insufficiency than using a powdered, non-coated form of the enzyme. Capsules should be opened and the contents sprinkled onto the food. Capsules are opened and the contents added to food. DO NOT ADMINISTER WHOLE! For cats and dogs under 10kg, 1 capsule per day. For dogs over 10kg, 2 capsules per day. The total daily amount should be divided equally between feeds. It should be sprinkled and mixed in with the food. Malassimilation syndromes in dogs and cats are well recognised by the veterinary profession; exocrine pancreatic insufficiency , irritable bowel syndrome, brush border enzyme deficiencies and bile salt deficiencies. These disturbances of pancreas or intestine wal function result in a decrease in digestive and absorptive abilities. Diagnosis of the primary cause of malassimilation and appropriate treatment is essential in all cases. Studies show for example that the occurrence of pancreas insufficiency correlates with the level of functional impairment of the pancreas. Importantly, clinical signs of insufficiency appear only below a residual functional tissue of about 10-20%. In the case of pancreatic insufficiency enzyme supplementation is generally the only course of action. Unfortunately in the majority of the cases this alone is not sufficient, as animals require long-term therapy to manage the condition for the rest of their lives. This will require feeding a highly digestible carbohydrate meal with low fat, high protein content. This combination ensures improved digestion and absorption of food, directly improving the overall health and body weight of the individual. Occasionally other supportive therapy is required (for instance insulin in diabetics or steroids in inflammatory bowel diseases). Why is Lypex different to other pancreatic supplements? Most pancreatic preparations come in a powder form and these enzymes are not protected from acid digestion. This result in two-thirds of ingested pancreatic enzymes being destroyed in the stomach before they reach the small intestine. To compensate for this destruction pancreatic enzymes powders are therefore fed in very high quantities and concentrations. 1) Causing erosion of the mucus membranes of the oesophagus and mouth. 2) Causing irritation to the skin of the owner and animal. Lypex is a unique veterinary pancreatic enzyme supplement using technology developed in the human field. The purified and concentrated pancreatic enzymes are made into micro-pellets and each pallet is enteric-coated. This gives 100% protection to the enzymes from the damaging degradative acids present in the stomach. Within then minutes of the pallets passing the stomach to alkaline environment of the small intestine the protective enteric coating dissolves and releases the protected enzymes to maximise digestion. Below are some recent questions we've received regarding Lypex Pancreatic Enzyme Capsules for Dogs, including answers from our team. Hi, my dog has recently been diagnosed with chronic pancreatitis. He's about 6.8kg. 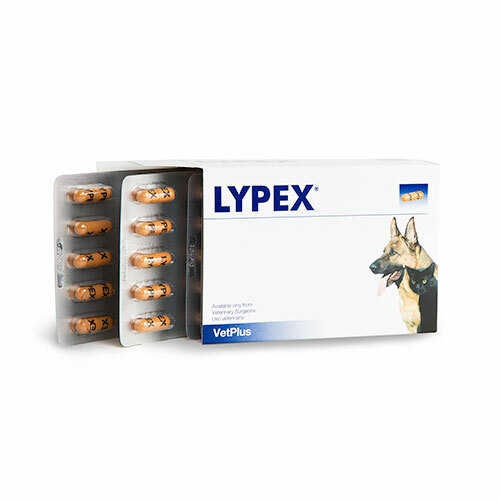 The instruction of Lypex says to give 1 capsule a day for dogs under 10kg. I wonder if I should divide the 1 capsule into two meals or just use 1 capsule for one of the meals a day. He eats 2 meals a day. Many thanks. It is best to divide the total daily amount between his meals. So half a capsule on the morning meal and half in the evening. My dog is currently on these tablets. Would I need a prescription to order them from yourselves? Fortunately these are classed legally as a food supplement and they are not controlled by prescription. They are freely available to buy off the website, but obviously you should follow your vet's advice regarding appropriate treatment and dietary advice for your dog. Pls could u advise if all capsules come in 0.6 size. There is only one size of Lypex capsule manufactured. All capsules are the same size and have the same amount of active ingredients. My dog has been prescribed Lypex for acute pancreatitis. However there were no instruction with the tablets and we have given the whole capsule to our dog not realising that they should be opened and the contents sprinkled onto food. This has happened three times before we saw your site and read your instructions. Is this likely to have harmed our dog in any way?